The Four Great Heavenly Kings are the heaven worriers who carry distinctive magical weapons. They have the great powers to control the weather and climate on Earth and protect the four corners of the world. Four Great Heavenly Kings oversee four cardinal directions of the world. In Chinese mythology, they are pronounced as "feng tiao yu shun," which known collectively as the benign climate. With such cosmic power, they are able to ward off negative energy and protect someone from dismal. Display them in the business area, the four Great Heavenly Kings are able to make things going smoothly, prevent the location from accidents, bring in luck of abundance and success. The Four Heavenly Kings are Mo Li Ching (Dhrtarastra), Mo Li Hai (Virupaksa), Mo Li Hung (Virudhaka) and Mo Li Shou (Vaisravana). Two of the kings have friendly faces and the other have fierce appearance. Mo Li Ching (Dhrtarastra) is the king of East. He is holding one Chinese instrument Pi-Pa which represents ease, comfort, and the good things of civilization. He is known as "The One Who Upholds the Land" who represents civilization, harmony and balance. Mo Li Hai (Virupaksa) is the king of West. He is holding a snake in one hand and a wish-fulfilling pearl in the another hand. Snake has the same meaning of dragon. The snake is the exchange of the dragon. He is known as the "The One Who has Broad-eyed" who can see through the good thing or bad thing. Mo Li Hung (Virudhaka) is the king of South. He is holding a sword to control evil and cut off trouble. He is known as "The One Who Enhances the World" who controls evil and enhances or improves the lives of all sentient beings. Mo Li Shou (Vaisravana) is the king of North. He is holding one umbrella in his right hand and mongoose in his left. The umbrella symbolizes his protection of the Dharma assembly whilst the mongoose to safeguard the wealth. He is known as "The One Who Listens Incessantly" who stands for knowledge and wisdom. 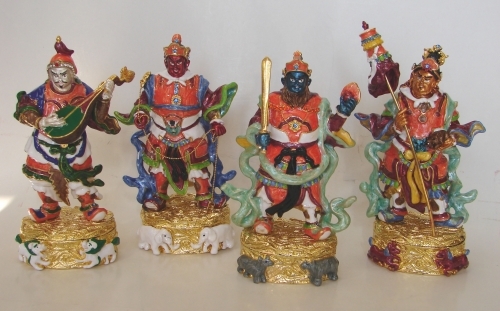 You can display the Four Heavenly Kings in your living room or four different locations of your house to enjoy the protection and bliss from them. The statues are made of metal. The dimension of each one is approx. 3.5" x 2 1/8" x 6". Each of them is approx. 2" lb.